Mangroves are tropical, coastal plant formations, that are both emblematic and representative of a large portion of Overseas coastlines. These forests develop in intertidal zones, in the coastal areas sheltered from the waves and currents. They are exclusively adapted to intertropical climatic conditions, and extend from Bermuda to the southernmost tip of Australia. Seagrass beds and coral reefs require clear water that lets the sun rays through, which are essential for photosynthesis, and therefore survival. The tangled mangrove roots create a strong shield that intercepts the particles drawn in by runoff water from the ground. Mangroves thus limit the turbidity of all water flowing into the lagoon, and ensure optimal conditions for seagrass bed and coral growth. As such, mangroves are ecosystems that are practically always associated with coral reefs, which is why they play an important role within the IFRECOR organization (French Coral Reef Initiative). French mangroves represent about 0.7% of all mangroves worldwide. In the Atlantic basin, they can be found in all French intertropical territories: Saint Barthélemy, Saint Martin, Guadeloupe, Martinique and French Guiana. In the Indo-Pacific area, these ecosystems exist in Mayotte, the Scattered islands in the Indian Ocean, New Caledonia, Wallis and Futuna and less frequently in French Polynesia. Their total surface area was estimated at 255,754 acres, mainly located in French Guiana and New Caledonia. 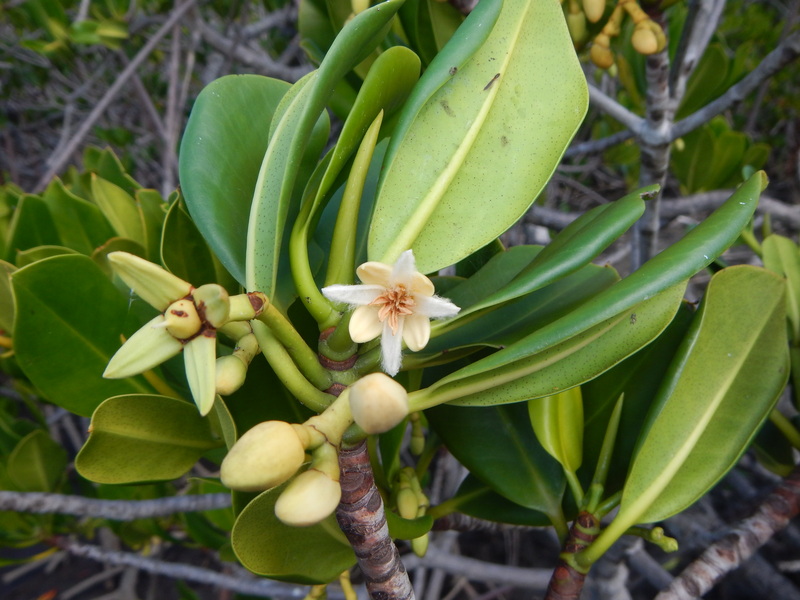 About 50% of the mangrove species listed worldwide are located in Overseas territories. They are home to about thirty species of mangrove trees and associated plants, but their distribution is unequal between the Atlantic and Pacific basins: indeed, there are only 5 species in French Guiana, whereas New Caledonia boasts 26. Mangroves are useful in our society in many different ways. Indeed, they provide a number of ecosystemic services: by dampening the swell of the waves they protect the human infrastructures built along the shoreline from the sea’s violence; they are breeding and nursing areas for a number of bird and fish species which have considerable economic worth on a local level, in particular for the fishing and tourism industries; by intercepting sediments and other polluting agents coming from inland, they reduce the flow of pollution towards the lagoon; they are some of the most efficient carbon reservoirs in the world; etc. Despite all these services, mangroves still have a bad collective reputation as they are considered “mosquito nests”, and because they emit bad odors, meaning they are sometimes poorly looked after. Although generally less threatened than in other countries, French mangroves are nonetheless the target of much violence – both of human and natural origin: artificial catchment areas, embankments, drainage, waste disposal, wastewater receptacle, rising seawater levels, storms, etc. Since 2008, mangroves have been identified as priority intervention sectors by the Conservatoire du littoral, given their ecological and landscape benefits. The Conservatoire du littoral is currently the owner, trustee or allottee of a little over 59,305 acres of mangroves, spread out over 54 sites in Saint Martin, Guadeloupe, Martinique, French Guiana and Mayotte. This surface area corresponds to a quarter of all French Overseas mangroves. Three years from now, as announced by the Prime Minister during the 2013 Environmental Conference, a third of all mangrove areas will be protected by the Conservatoire du littoral, i.e. about 86,487 acres. In 2010, IFRECOR and the Conservatoire du littoral published an Atlas of French Overseas mangroves, that accounted for all our knowledge of ultra-marine areas: Overseas departments, territories and entities – including French Polynesia – in which mangrove trees have been recently introduced. In French Guiana, mangroves are not directly related to coral reefs, but they cover sufficiently large surfaces to be considered by IFRECOR anyway. It should be noted that although these mangroves in French Guiana are not closely linked to nearby reefs, they nonetheless contribute to the health of the Caribbean basin and its associated reefs. This atlas showed significant discrepancies in the knowledge we have of mangroves, as well as major discrepancies regarding the studies and monitoring data used. This observation led to the implementation of a mangrove observation network, the management of which was entrusted to the Conservatoire du littoral in 2012. This observation network is one of the cross-cutting actions implemented by the Overseas division of the Conservatoire du littoral, and reinforces the actions carried out by the Mangroves & Overseas Wetlands Resource Center, also managed by the Conservatoire du littoral. The mangrove observation network was initiated within the cross-cutting theme “Observation networks”, in turn initiated within Focus point 3 of IFRECOR’s national action plan: developing research, monitoring and decision-making tools. Therefore, during the 2011-2015 time frame, the mangrove observation network’s goal is to connect the stakeholders working towards the protection and management of these areas, to enable improved data harmonization regarding the status and development of Overseas mangroves, and to set up a coherent national network. In the long-term, the Mangrove observation network will develop a functional monitoring network (mapping, biology, physics & chemistry, etc. ), in order to detect any changes and provide decision-making tools to those who manage these areas. The results and data obtained thanks to this network will be added to the information already established by the National Biodiversity Observatory, the National Wetland Observatory and the Information System of Nature and Landscapes. Activity 1: develop a monitoring methodology that suits both the various regions concerned and the protection stakeholders involved. This methodology must include a harmonized typology of all existing mangroves (and flooded forests), and the creation of a database with all changes noticed regarding mangrove surface areas. Activity 2: this data will be correlated with the creation of a progressive mangrove map, which will serve as additional information to the maps produced for other associated ecosystems, and in particular marine phanerogam grass beds and coastal wetlands (jointly with the Mapping cross-cutting division). Activity 3: Think tanks will be organized, regarding the cross-referencing of data concerning mangrove development with studies conducted on coastline sediment dynamics (beach types, developments caused by climate change, direct anthropogenic development, etc.). Activity 4: Lastly, the development of stress and management measures will need to be monitored (protected surface areas, stakeholders, etc.). These activities are managed by the Conservatoire du littoral’s Overseas division.